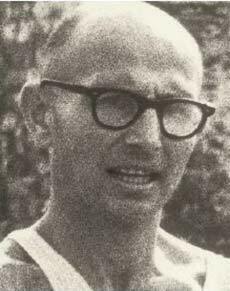 One of the top race-walkers of the 1960s–70s, Shaul Ladany set the World 50-mile record in 1972. His 7:44:47.2 shattered the existing world mark that had endured since 1935. Ladany was a gold medallist at the '72 World Championships in the 100k event (9:31:00). He was top walker at the U.S. Championships five times between 1973-1981, winning the 75k championships 1974–77, and 100k title in 1974. Shaul won championships in Belgium 1971 and 1972; Switzerland 1972; and South Africa 1975. As an 8-year old in Belgrade, Yugoslavia during World War II, Shaul was sent to the Bergen-Belsen concentration camp. A U.S.-inspired ransom deal saved 2,000 camp prisoners, of which he was one, and brought him to the United States. After Israel became a nation, Ladany emigrated to the Holy Land, where he began his track career as a marathoner, but changed to walking in the early 1960s. Ladany was the lone male member of the 1972 Israeli Olympic men's track team who survived the Arab terrorist attack that took the lives of 11 team members.